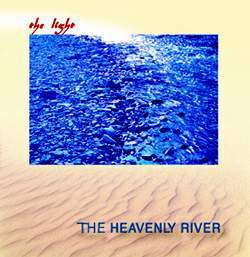 Formed in 1998, The Heavenly River instrumental group took part in a number of Ukrainian jazz and other festivals as well as international festivals of spiritual music held in Italy, Greece and Russia (namely in Moscow), and participated in various concerts. They have regularly played at the musical clubs of Kyiv, were guests of a 'Resheto' musical TV programme on TET Channel (Kyiv) where they gave a performance and an interview, contributed to the 'Puls asfalta ' ('Pulse of asphalt') project of the TV company "Ulichnoe televidenie" ('Street TV').The year 2001 saw their debut album, The Light. The musicians put the main light on the state of harmony and unity with the Nature, as well as Spiritual Enlightment The music played by The Heavenly river can be defined as extra-style oriental music closed to New Age (World Music) and distinguishingly blends elements of ethno-jazz based on the rhythmical foundation of Indian classical music (tal) with Slav's folk melodics and jazz harmony and improvisation. Before the group were poured together, everyone of the five performers had been in the artistic exploration, seeking their way in, it might seem, never-converging musical styles.Ruslan Pashinsky and Valeria Marchenko had long been trying themselves in jazz, engaging in different jazz projects and playing at festivals with a variety of jazz bands.Professional musicians Sergey Puchkov and Sergey Isakov were members of some rock groups. To the current project they bring the knowledge absorbed in India during their study at the Academy of Music and Arts, Nagpur, India. There Puchkov was developing his skills in playing on drum tabla while Isakov was mastering Indian slide-guitar. 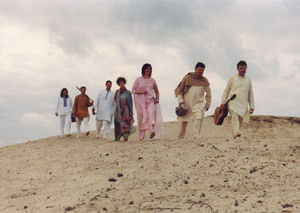 We need to say that Indian culture and traditions were the creative source that has been feeding The Heavenly river from its very beginning.The artists' quest resulted in somewhat a fusion of musical styles and cultural traditions of the East and the West that gives space for the seeking for the original form and sound of a composition. Their music gives auspiciousness and brings positive energy and it is not as much a musical experience as rather that of Spirit. Nativity of Universe is flowing in a slow tempo, a very nice opening organ section continues with citar and sax improvisation ... instrumentally treated Vishwa Vandita with a beautiful vocal and a flute will remind us of one of the many versions of this beautiful song ... Magnificent! Make certain that you will buy this album, it is worth it!